New Orleans is defined by the cliché: So many choices, so little time. That holds true for those visiting this great American city before or after a cruise. No matter how much time you can spare, there is something here to entertain you. And while many cruise ship passengers prefer to eat all their meals onboard, even when in port, few cities offer so many tempting restaurants. The city’s stereotypes don’t call to mind fun for kiddies, but the Louisiana Children’s Museum, 420 Julia St., offers a range of interactive exhibits. One of the special treats here for everyone who’s read Mark Twain’s Life on the Mississippi: the computer that lets you steer a ship down the Big Muddy. / On the edge of the famed French Quarter is the Presbytere (751 Chartres), a National Historic Landmark and part of the Louisiana State Museum system. It has a permanent exhibit on Mardi Gras, including spectacular costumes, tiaras and necklaces. / On the riverfront near the convention center is the new home of Blaine Kern Studios, 1380 Port of New Orleans Place. Since 1947, these artists and craftsmen have created the majority of the colorful floats used in these parades and many others elsewhere in the country. The vast complex — 400,000 square feet — is home to Mardi Gras World, which offers tours, plus special event venues and corporate offices. New Orleans is one of America’s few cities still using streetcars. Here, one runs parallel to the river, from the French Quarter to the Warehouse District, which has been revived with art galleries and artists’ studios. The Canal Street line heads from the river out to City Park, with its Storyland amusement park. The St. Charles Avenue line is a fine ride past fashionable homes in the Garden District. For something slower-paced, horse-drawn carriages are available for narrated tours of the French Quarter. Mardi Gras is restricted to a few weeks of parades, but the French Quarter exists to feed, tempt and entertain 365 days a year. Beyond the bars, risqué nightclub shows and ubiquitous carts selling Lucky Dogs to the hungry are retail shops. Royal Street is famed for its quality antique stores. The French Market (1008 N. Peters St.), one of the nation’s oldest public markets, offers original artwork and regional specialties. The Quarter also boasts art galleries, shops specializing in voodoo items (including custom-made specialties) and a city landmark, Jackson Square. A short stroll from the cruise terminals is the Riverwalk Marketplace on Poydras Street. Browse more than 100 shops and pop into the Southern Food and Beverage Museum. For night-time adventure, explore Bourbon Street or try your luck at Harrah’s New Orleans Casino on Canal Street. You’re sure to find good times at Tipitina’s, a concert venue at 501 Napolean, and Mulate’s, the established Cajun food and dance hall, at 201 Julia St.
For something different, put on your dancing shoes and head to the Mid City Bowling Lanes, also called the Rock ‘n’ Bowl, at 3016 S. Carrollton Ave., which offers live music most nights. There simply are way too many fabulous restaurants to consider without devising a plan. Several standards should be considered first when time is limited. For breakfast, there’s the legendary Café du Monde on Decatur Street, at the edge of the French Quarter. The bustling Cafe is famous for its bite-sized, powdered-sugar-covered beignets and its chicory coffee. Of if your appetite can wait until you reach the far end of the St. Charles Avenue streetcar line, pop into the charming Camellia Grill, 626 S. Carrollton Ave., and try the pecan waffles. Don’t be deterred if there is a line of people waiting to get in — that’s just confirmation of your wise choice, and the patrons do move in and out quickly. It’s tough to beat a New Orleans’ muffaletta -– a round loaf of crusty Italian bread sliced and typically filled with Provolone cheese, Genoa salami, ham and green olives. This meal-on-a bun, a city landmark, was created in 1906 at the Central Grocery, 923 Decatur St.
For the city’s other sandwich staple, try Johnny’s Po-Boys at 511 Saint Louis St., where sandwiches are stuffed with a variety of meats or seafood. Regional cuisine favorites include Creole -– emphasizing seafood prepared with a mix of West African, French, African-American and Spanish influences -– and Cajun, which is typically more spicy. Can’t-miss Cajun dishes are served at K-Paul’s Louisiana Kitchen, 416 Chartres St.
For Creole cuisine, consider a trip to Royal Street for either Mr. B’s Bistro or Brennan’s. Another good choice is Galatoire’s, 209 Bourbon St. For Creole in simpler surroundings, it’s the Gumbo Shop near the St. Louis Cathedral on Saint Peter Street. If it’s Sunday, take a cab to splurge on brunch at the beloved Commander’s Palace, 1403 Washington Ave. Whether in town for a few hours or a couple of days, plan ahead so you can enjoy all New Orleans offers. 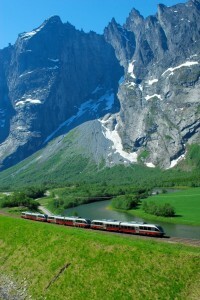 The Rauma train passes by the mighty Trollveggen, which juts 1,000 feet up. © Leif J Olestad. Andalsnes, Norway – Even at the purposely slow pace of 38 miles per hour, there is no clickety-clack, clickety-clack on the Rauma Railway. That sort of noise was eliminated long ago, when the Norwegian State Railways (the NSB) modernized its rolling stock. It’s just as well there is no noise to distract passengers from enjoying the landscape of what the NSB proclaims is “the most beautiful train journey.’’ So the engineer keeps the speed at less than half its maximum — even stops the cars — to let amateur photographers onboard photograph waterfalls, mountains and lush valleys, bridges and the Rauma River itself. A crowd-pleaser is the Trollveggen, the Troll Wall, which soars more than 1,000 feet above the valley floor and is Europe’s tallest vertical rock face. “Most of our train routes are for pleasure, while other nations use trains just for transportation,’’ says Wenche Berger, international sales manager for NSB. “We need to increase our capacity, to serve more passengers.’’ Indeed, the only high-speed run in the entire country is between Oslo and its international airport. 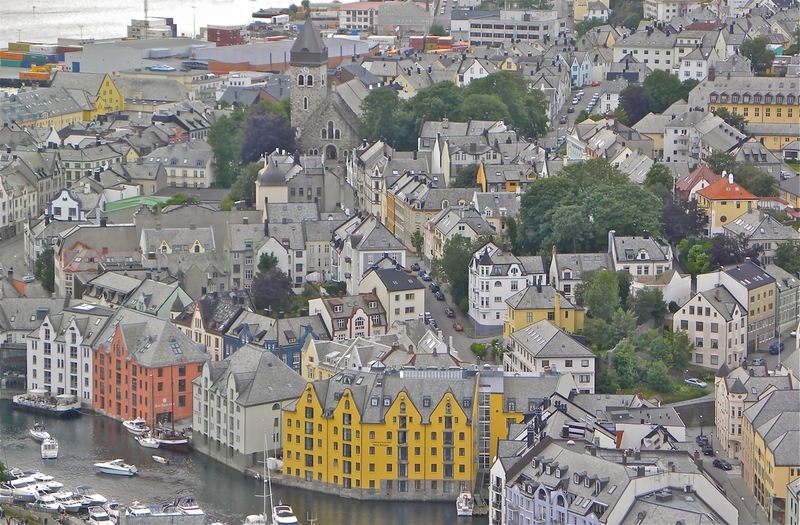 The Art Nouveau town of Alesund, viewed from a scenic overlook. Robert N. Jenkins. Passengers ride in 73-seat, air-conditioned, toilet-equipped cars with leather seats in the “Comfort Class’’, fabric in second class. There are vending machines but no bistro car, which on other NSB trains means a bartender/cook selling prepared cold sandwiches, snacks beverages and the popular Norwegian hot dogs. 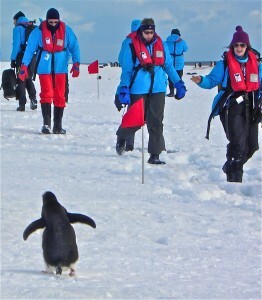 On the sightseeing routes, reservations are recommended for the high season – typically the last weekend of May through the end of August. On the Rauma route, 47 percent of 2009’s 78,000 passengers traveled just during those three months. What they get in 90 minutes is a 2,000-foot descent through spectacular landscape. The horizon is filled by mountains that climb as high as 4,800 feet, plus Trollveggen’s shorter cousins, inspiring waterfalls – the Vermafossen drops 1,181 feet – and the dramatic Kylling Bridge. Here, the train must double back through two tunnels to drop down and traverse the bridge, crossing 182 feet above the Rauma. Even the river itself changes colors, from water so clear the sandy bottom looks like a Caribbean seashore, to a hurrying, emerald-colored stream infused with glacial silt. The Rauma route is conveniently reached by a train from Oslo to the town of Domblas, a 212-mile ride that offers relaxing but less impressive scenery. 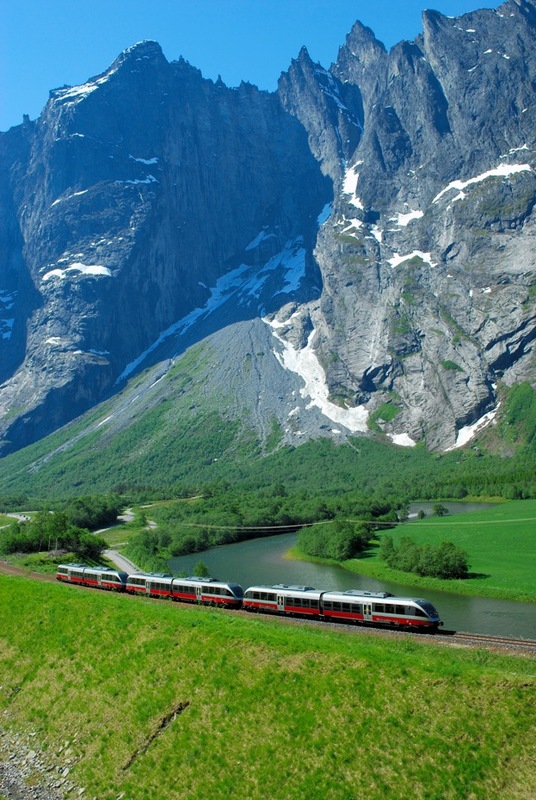 The Rauma train departs twice daily from Domblas to Andalsnes, a cruise port on a fjord that is a popular base for trekking through area highlands and canoeing on the Rauma. But many arriving Rauma passengers then catch a bus onward to the charming town of Alesund, a Norwegian Sea port that was largely destroyed by fire in January 1904 and quickly rebuilt in the then-popular Art Nouveau style. Dozens of those buildings, their facades adorned with typical artistic flourishes, dominate the compact downtown area. A museum tells the story on the fire and of Art Nouveau. The museum, Jurgendstilsenteret, is in the former town pharmacy; over three floors are old photos, a movie with English subtitles, architectural models and period pieces from both the family that lived over the pharmacy, including their rich dining room, and other Nouveau objects. A free walking tour pamphlet directs visitors to more than 20 of the historic buildings. 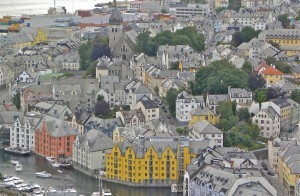 Alesund also boasts an art district. Visitors and locals can see artists working in glass (you’ll wonder how Ingird Ulla can let her tabby kitten wander about the display shelves in her studio/workshop) and in wood – Peter Opsvik’s gracefully bold service pieces have been shown both in museums and in galleries throughout the U.S. The town, though a major commercial fishing port, is also a tourist destination for exploring nearby fjords, mountains and fishing opportunities. There’s also a popular daytrip into one of the most beautiful fjords, Geirangerfjord, which is a UNESCO World Heritage Site. To round out a sampling of Norway’s popular transportation styles, visitors often book aboard the nightly departure from Alesund on the famed Hurtigruten. Once the coastal villages’ cargo and mail lifeline, Hurtigruten is now much more a passenger and car ferry. Cabins, each with a bathroom, range in size across the 13-ship fleet, but each vessel has dining rooms, lounges and accessible deck space for viewing the passing coastline, isolated fishing villages and fjords. 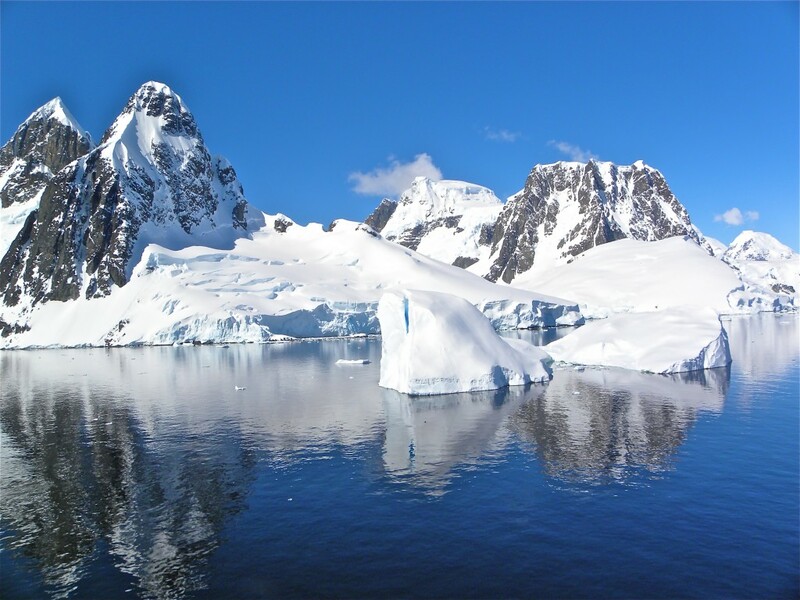 All Hurtigruten vessels take either six or seven days to run between Kirkenes, a port well north of the Arctic Circle near the Russian border, and Bergen, Norway’s second-largest city. 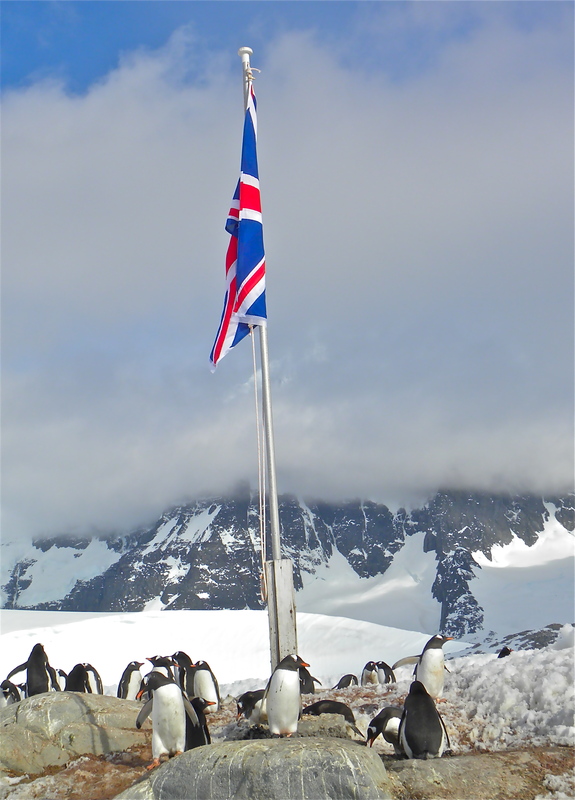 From Alesund headed south, it is a midnight departure and a 2:30 p.m. arrival the next day. Bergen, a thoroughly modern city sprawling past the mouth of another fjord, boasts fascinating remnants from its centuries as one of the four “offices’’ of the dominant German merchant organization, the Hanseatic League. Just along the busy, touristy, wharf, visitors can wander through the 450-year-old fortress complex focused on the Rosenkrantz Tower, then walk past 11 structures that are part of a UNESCO World Heritage Site, and turn up narrow alleys passing renovated medieval warehouses. Also on the wharf is the well-done three-storey Hanseatic Museum, in a preserved merchant house that was simultaneously a dormitory for workers, office space and cod-storage area. A film, furnishings and artifacts explain the life of the trading city life from 1360 to 1754. Bergen also boasts a number of other ancient buildings and modern museums focused on art, maritime heritage and natural history, including the oddly affecting Leprosy Museum, in a centuries-old hospital that cared for victims into the 20th century. Both the train from Oslo to Dombas and the Rauma Railway are included in the Eurailpass, a network of discounted rail tickets in 21 Western and Central European nations. The pass can be bought for various numbers of travel days over various periods of time, and it can be bought for any one of the participating nations, for three to five nations, for a region or for all 21 countries. For visitors who plan to see more than jut a couple of destinations, any of the options is a cost-savings over buying individual tickets. For details, go to www.eurail.com.